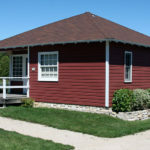 The Birch Cottage was formerly one of ten shore cottages at the Liberty Park Lodge on the north side of Sister Bay. 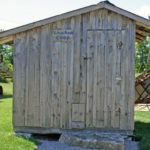 This chicken coop was built by Don “Yukon” Erickson in the 1990’s at the Erickson Appalachian farm in Sister Bay on Scandia Road. 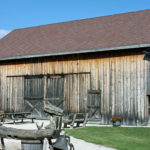 The signature building of small-grain farming in the mid-west is the granary. 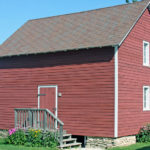 Hundreds of these buildings still stand in Wisconsin. 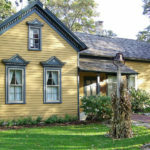 Built in 1875 in Marinette, Wisconsin, the fancy farm house with architectural features unlike any other Sister Bay farm house, was brought to this site in 1895. 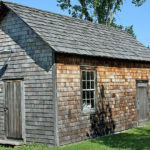 Before the automobile made its appearance in Sister Bay, several blacksmith shops were active in the area. It was an essential industry in the era of horse-drawn carriages, buggies, and farm horses. 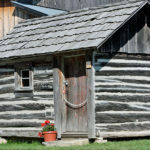 The term “outhouse” originally referred to any small structure away from the main building, such as the farmhouse. In America the term came to mean the outdoor toilet facility when running water was not common in the home. 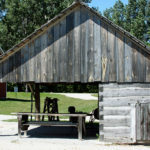 The long narrow machine shed was typically found on smaller farms. They vary in design according to the farmer’s needs. 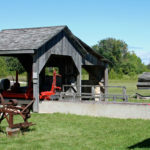 The largest building at the Corner of the Past site is known as the Koessl Barn, which once dominated the 90-acre Koessl Farm and Homestead located on Highway 57 just east of where Hwy 57 and Hwy 42 meet south of downtown Sister Bay. 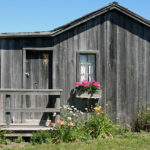 Built by Hans Olaf Hanson (1847-1920) when he lived on a farm in the Appleport section of Northern Door County near Lake Michigan in 1884. 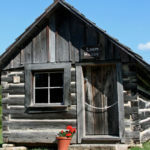 Don Erickson purchased two cabins in late 1980s or early 1990s and moved them to his property on Scandia Road. 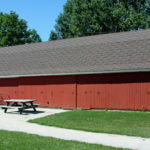 Many farms in Wisconsin had separate small buildings situated just steps from their main home which they called their “summer kitchen”. Prior to the advent of mechanical pickers, cherries and apples were harvested by migrant workers. 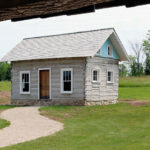 This log cabin was built around the turn of the 20th century by a member of the well-known Olson family in Ephraim. 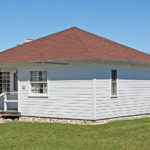 Like The Birch Cottage, The Balsam Cottage was formerly one of ten shore cottages at the Liberty Park Lodge on the north side of Sister Bay.